★★★★★"Hi Lynda and Kevin, I’ve been meaning to email you to say how much we love our new wardrobe!! It’s fantastic and makes it so easy to be organised. I can now clearly see all of my clothes instead of searching for them in my old, dark wardrobe. The wardrobe is really functional and looks great too – we love the walnut fascias. And we're so glad we got Kevin to install it - there is NO WAY we could have done it ourselves! Thanks again – we’ll be back in touch if we want to expand our wardrobe or organise other areas of the house." ★★★★"I would like to thank all the staff at the Wardrobe Man Wangara for making our wardrobe buying experience truly pleasurable and cost effective. Helpful staff who go the extra mile to assist you in your choice. I chose to erect mine myself and found the system extremely simple to install. We had been to lots of places before finally going to the Wardrobe Man. Should have been the first place we went to." ★★★★★"Kevin and Lynda and their team at The Wardrobe Man were a pleasure to deal with. Their expertise and attention to detail made the whole process from design to build simple and delivered a fantastic result...we love our new walk-in wardrobe. Thank you." ★★★★★"Big thanks to Lynda and Kevin for arranging the robes in our new home. Not only were you both sincere and helpful in the design process, you even managed to fit in installation within our tight timeframe. Your advice and design expertise meant we could perfectly fit out our different sized robes to suit the sliding doors, and your installers were fast and professional. We are looking forward to popping back in to say hi and choose some more components. Great people, great service, we really appreciated it. Thank you for making the wardrobe selections a pleasure." ★★★★★"We replaced our double track sliding wardrobe doors with a triple track slim line doors, Lynda and Kevin are a pleasure to deal with and I found the whole process so easy thanks to their knowledge. The doors were made and delivered in a short space of time. We installed them ourselves and that was very easy for my husband to do. I am so happy with the end result and would recommend The Wardrobe Man to everyone. 10 out of 10!!" ★★★★★"We would like to thank Lynda and Kevin Harrison for the providing an ideal solution to our uniquely spaced walk-in wardrobe area. The appearance of our wardrobe walk in was fabulous and display that quality attribute of it. We wouldn’t hesitate to use The Wardrobe Man for future wardrobe solution." ★★★★★"It was a pleasure dealing with a business that has my values, which is. 'Do a job properly or not at all'. You can see why Lynda & Kevin have been in this business for so long. They are 'perfectionists' that supply good quality products that are not cheap & nasty with good old fashioned customer service. Thanks Lynda, Kevin & staff we are very happy with our new cupboard & study desk with shelving." ★★★★"Thank you very much for the friendly and helpful service I received from yourselves. The wardrobe doors was made to size and they look great too. I would definitely recommend you to anybody looking for a top quality wardrobe." ★★★★★"We have just had our 5 metre long built-in-robe installed by The Wardrobe Man and couldn’t be more delighted! The 5x 5 panel gloss doors are simply splendid and the internal Elfa fittings are exactly what we wanted. Kevin and Lynda were lovely to deal with – efficient, knowledgeable and flexible, and we were pleasantly surprised by the cost. Kevin had to work in with our carpenter [it was a tricky raked ceiling] who commented that Kevin was unusually helpful and took the time to answer Dave’s questions in depth. The installation went quickly and smoothly [thanks to Kevin and Ian’s great teamwork] and we now enjoy lingering in bed just to look at our new wardrobe!" ★★★★★"The Wardrobe Man has designed, built and installed a wardrobe that has definitely met our expectations. It was a pleasure to work with this business as Kevin, Lynda and their team have good knowledge of various wardrobe components and can advise on, source and construct an individually modified system. They ensure complete satisfaction with their work. We also purchased an art hanging system and appreciated The Hanging Man's technical advice so that we could successfully install this ourselves.This is a business run with integrity and we will be recommending it to others." ★★★★★"I absolutely love it! It has taken my boring spare bedroom from basically being a "junk" storage room to a room I want to move in to. I have the Elfa wardrobe along one wall with drawers, hanging space and shelves then continued on with a study desk and shelves on one side of the wardrobe and some great looking hanging space for my scarves and belts on the other side. It is not only extremely practical but looks amazing as well. On top of the appearance and practicality I was also impressed with the service and installation. Lynda spent quite a few hours with me in the showroom designing my new room and Kevin was on time and professional during the installation - He even cleaned up after himself and took away all the empty packaging. 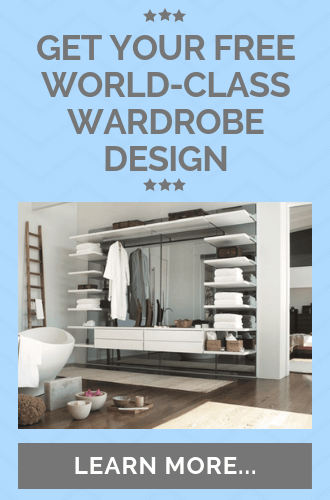 If you are after a new wardrobe, hassle free installation and a personalised design, I say look no further than these guys at The Wardrobe Man." ★★★★★"A BIG thank you to Lynda and Kevin from The Wardrobe Man on the design and installation of the Elfa System in our walk in robe. Their knowledge of the products they sell is second to none, they know how to get the most out of every inch you have to work with. They came to install the system when they promised and left no mess. Love how our walk in robe in now an organized and functional piece of the house. We would definitely use them again without any hesitation." ★★★★★"Thank you Lynda and Kevin. We are extremely happy with the end result. I was impressed as to how Lynda was able to come up with designs which suited the space available in both the pantry and the walk-in-robe and Kevin installing same even if he had to make a trip to Bunnings to do so. I did not believe that the shelves would fit in the pantry but what a surprise to find the door misses them by a smidgeon! Great to be able to walk in and pick a product without having to break my back going to the back of a dingy pantry. We now seem to spend so much time in our walk-in-robe making choices as we are able to see our clothes and shoes all together for the first time in years - definitely too many clothes/shoes - I feel a cull coming on!" ★★★★★"Our Elfa system is going fantastic thanks. We are very happy that we purchased it for our WIR. Our friends love it too. Best wishes and hi to Kevin." ★★★★★"Thanks so much, Lynda and Kevin! I highly recommend their business, The Wardrobe Man. Lynda and Kevin provide a friendly and professional service, which is carried out quickly and efficiently. Lynda has a comprehensive knowledge of the product and made very helpful suggestions. It was only a few days from our first discussion to installation of kitchen pantry drawer units. I just love them: no more crawling on the floor to get to the back of the bottom shelf! Fantastic!" ★★★★"The installation went well the most time consuming part was demolishing the existing shelves and then repairing the paint. I?m happy with the Elfa system, it has provided me with a lot more flexibility and a much neater walk in robe." ★★★★★"You get what you pay for. It was more expensive than a pre-fabricated set of wooden shelves and drawers, but now we have a wardrobe design that meets our exact requirements and which allows us to change the configuration as we desire. The installation was completed without mess or damage - something we have rarely experienced with tradespeople before." ★★★★★"We were very happy with the speedy effecient service provided by Lynda and Kevin at The Wardrobe Man. They were on time every time and completed our walk in robe and wardrobe to a very high standard. We appreciated Lynda and Kevin's indepth knowledge of their pproduct and they were very accomodating with the design, considering they had to work aropund an alarm system box!! The walk in robe is so much more organised and it is easy to locate items that were once lost in the deep, dark shelves that exist no more! Thank You Lynda, Kevin and Christopher! It's very addictive, the kitchen might just be next....."
★★★★★"I just love, love, love my new wardrobe by The Wardrobe Man. From conception to completion the service I received from The Wardrobe Man was exceptional, I also really love how it is a family owned and operated business. The design and products are just fantastic, it really is the perfect solution even for the super organised! Thank you for making my wardrobe my favourite room in the house!"